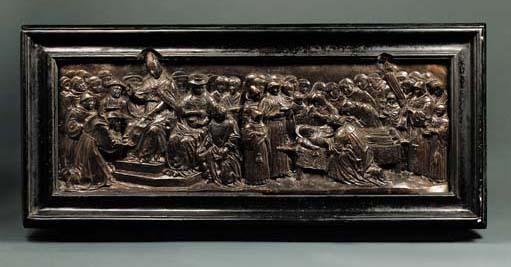 In a later carved ebonized wood frame and stand; depicting Pope Honorius III confirming the establishement of the Franciscan order and the Funeral of Saint Francis. J. Pope-Hennessy, Italian Renaissance Sculpture, London and New York, 1971, pp. 30, 291-291, fig. 51. The scenes depicted on this relief closely follow the iconography of Benedetto da Maiano's celebrated pulpit of about 1474-75 in the church of Santa Croce in Florence. The artist of the present piece, probably a Tuscan working in the 16th century, has adapted two of the five narrative reliefs on the pulpit - Pope Saint Honorius confirming the Franciscan Order and the Funeral of Saint Francis - in order to fit into the narrower pictorial space of this rectangular relief. He has achieved this mainly by removing the elaborate architectural background which fills the upper half of Benedetto's original composition and by adding figures to fill the background.